OK...time for a quick shorty post here. The Spring academic semester is winding down and I've successfully survived teaching my first full course to a room of wide-eyed undergrads. 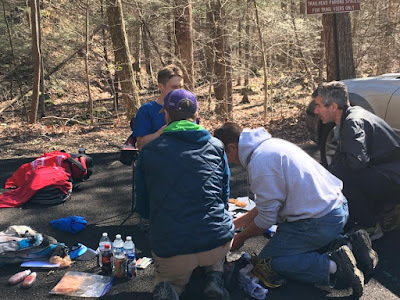 I think the experience has been sobering and certainly makes me have a much greater respect for people that develop multiple courses at once. "Survived my last Paleoclimatology lecture today. It's been a fun and challenging semester, but overall I'm very glad with the way things turned out. Thank you BU Earth and Environment Dept. for giving me the opportunity to teach the course and hopefully pass along some knowledge to a few young minds. 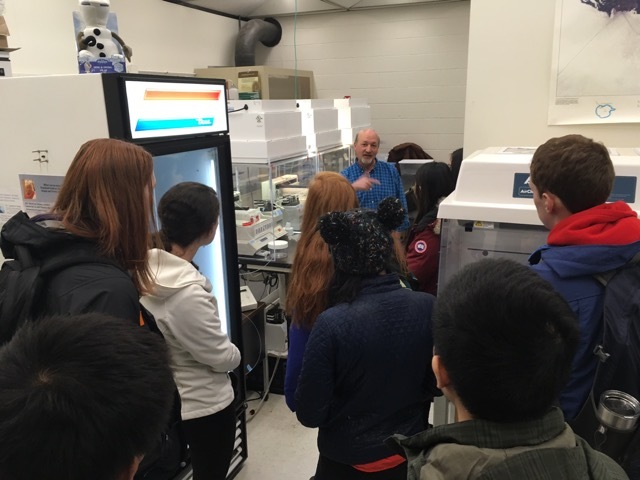 Thank you also to Dave and Erich at Dartmouth for hosting my students for the day in the ice core lab. It has all been a humbling experience and one I am very grateful to have been given. In the wise words of my graduate school advisor, "Onward!" So on to running/racing stuff. This past weekend I tested out my racing legs yet again by participating in the TARC Spring Classic. Normally I would have opted for the 50k distance along this course, but because of Miwok just two short weeks after, I opted for the Trail Marathon version. 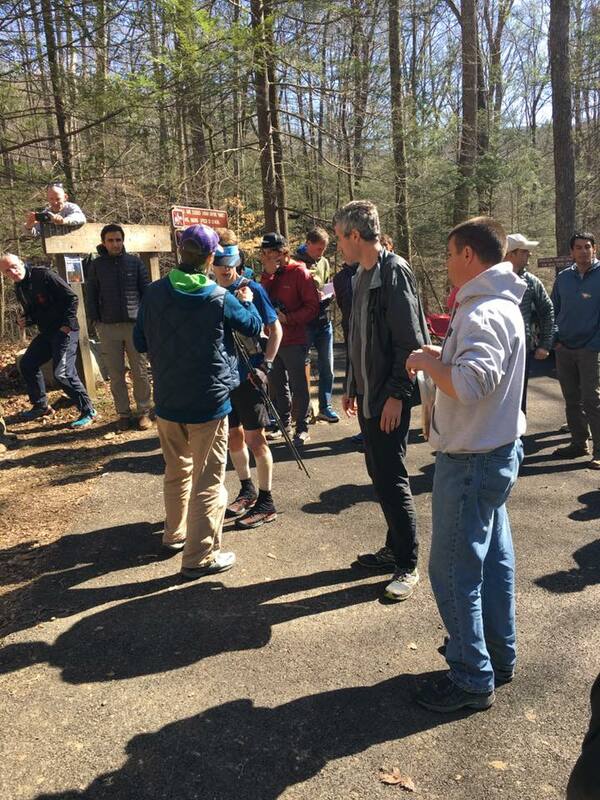 The course features a 6.5 mile loop, so the marathon was simply 4 loops, while the 50k was 5. Admittedly, the marathon field was much less full as most chose for the 50k option, but still I was quite thrilled with the result. My only goal was to have a consistent run. In other words, I didn't want to have one of my usual races where I look at the pace data later, only to see that the final 25% of the race I dropped off significantly. I wanted to see a relatively flat line across the board. I knew this would mean going out at what would feel like a very slow pace, but this race was just meant to be a fun prep race...so what better place to experiment. While I did slow down a small amount on the fourth (and final) loop, it was not as much as usual, and my splits were really consistent. I ran exactly as I was hoping, and only stopped one time between loops 3 and loops 4 to restock my hand-helds. I never walked for more than a few steps for the entire race and managed to average a sub-9 min/mile pace for the entire event. I was pleased with this pace for a trail marathon for sure. When I crossed the line, I found out moments later that I had actually placed 3rd overall in the Marathon...but more importantly, I was 1st master runner! This is my first Master's victory now that I've cross the magical 40-yr line. I'll take it! My finish time was right around 3hrs 55mins, or about 8:53 per mile. The best part of the event is that it was so close to my place outside of Boston (about 7 miles), that I actually biked to and from the start line. Needless to say the bike ride home was a little more uncomfortable than the ride there. So now we come to next weekend. My taper is slowing down as I prepare for my first "big" race of 2017: The Miwok 100K. I'm super excited for this race. Every picture I see of this course just looks magical and I absolutely cannot wait to run along it. I think of Rocky Horror Picture Show. I am shivering with anticip..........ation! I honestly don't even care how I do time-wise...as the course just looks so damn lovely. So I just looked it up, and I would need a 15:30 finish (or faster) to qualify for WS next year. Cool. A lot has happened these past few weeks...too much to really talk about on here. 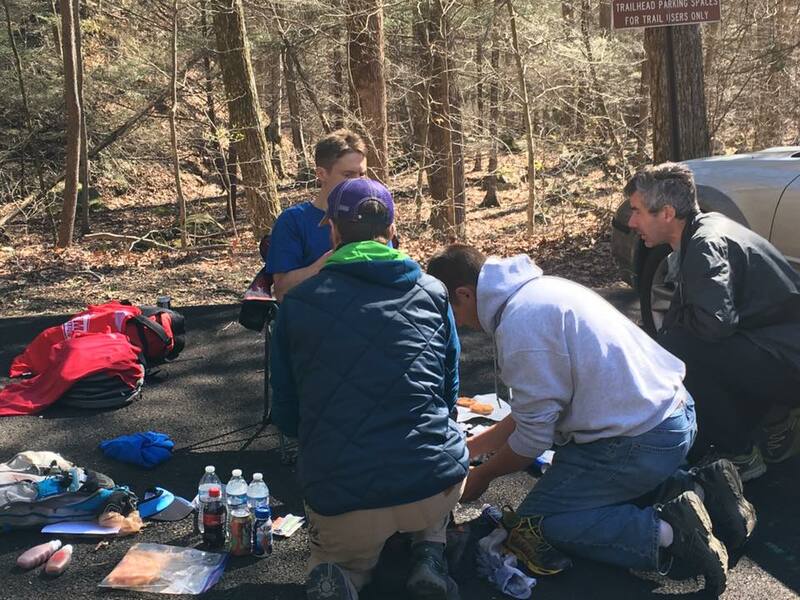 This past weekend was the 2017 running of the Barkley Marathons and I was fortunate enough to be asked by my friend John Kelly to be a part of his support crew (along with various members of his family and fellow Barker Julian Jamison). I have spent the past 7 days trying to think about the best way to tell my story this year, but I've realized that I don't have a story to tell. The Barkley is about the runners, not the crew...and this was John Kelly's year. As inspired and amazed as I was to be there and be a part of Barkley History, my actual role was trivial and only in the background. I took a lot of great pictures from the weekend, but while spectating from the Fire Tower on the final loop, my phone got too wet and fried (and I lost everything). I suppose it's fitting that all of my "photos" are just in my thoughts now. This was also a very emotional year. The ending (which most of you probably now know), was both incredible, and heartbreaking. I'm not sure I can remember a time when I swung so quickly from ecstatic joy, to utter heartbreak so quickly. This has been a tough Barkley year to digest on many fronts. I think that is all I will say about that as I'm honestly not sure what I else I can say. "I am Haunted. Constantly. I am haunted by disbelief. 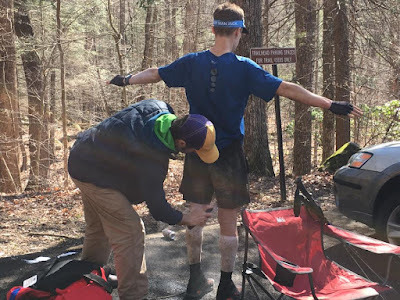 Every single day since I left Frozen Head State Park on April 2nd, I think about what happened, and my experience participating in the Barkley Marathons. But, every day that passes, the less I actually believe it really happened. I think back to specific memories I have of being lost on the course, getting water from a creek, picking ticks off of myself, or laughing alongside Alan...and I start to wonder if it wasn't just a dream. I look at results listings and postings on the internet that list my name, but somehow I no longer believe it. 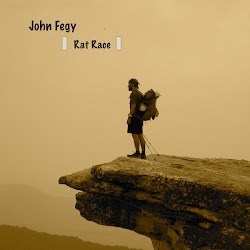 I email Ed Furtaw and ask him, "Did I really finish? Was I really there?" He assures me I did, and that I was. 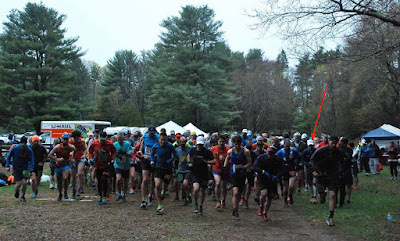 I see pictures at the finish of me touching the yellow gate and it simply feels that it can't be so. It has been tearing me up. I've seen so many people say online that I "shouldn't have finished", that I'm not an "elite runner", or that I just got "really lucky"....and sometimes I actually start to believe them. But then I think about how damn hard I trained. How many God-awful hill repeats I did....over and over and over and over.... How I spent 15+ hours every weekend training on hills and trails. how I did two-a-day workouts during the week (every week) of more hills, and how I studied that Frozen Head map for months. I think about how I sat every single night at the dinner table down in Antarctica while others were playing cribbage and poker, and I studied race reports and scribbled down notes and compass bearings. I tell myself that I did finish dammit...and it was because I trained hard enough, and wanted it badly enough. But then I wake up the next day and I don't believe it again. In a way, I've tried to mentally "Earn" my Barkley finish by spending the rest of this year pounding out countless ultras. I've run harder, and at more races this year, than during any previous year. I thought finishing Badwater would somehow make my Barkley finish feel more real. It didn't. I thought perhaps finally breaking 25 hours at Leadville would make me accept my Barkley finish as non-fantasy. It didn't. 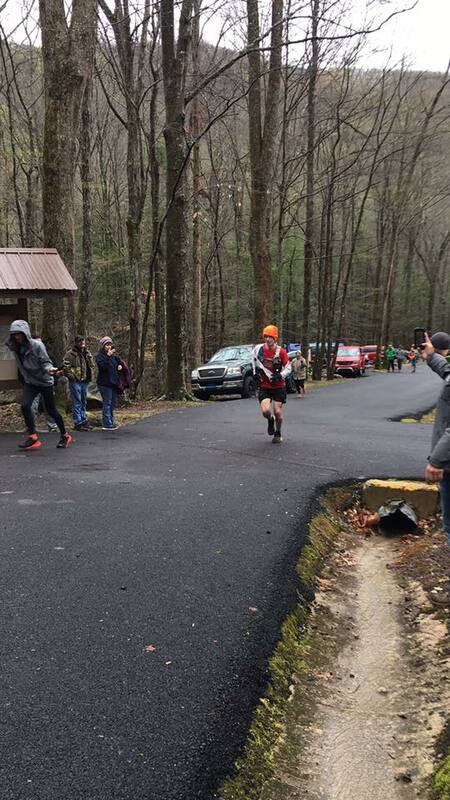 I even thought that if I simply ran a large volume of races, I could somehow earn my Barkley finish. After a long year of racing multiple ultras (Five 100-milers), I still fail to believe that Barkley really happened." 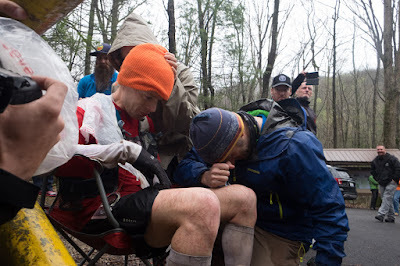 "Lots of emotions this past weekend in Frozen Head. Haven't stopped thinking about it since leaving the park. It was surreal being on the other side of things. Thanks for asking me to be on your crew JK...it was quite a privilege. Watching you run up that road to your 5th gate was utterly indescribable. Pure magic my friend. You will never forget this moment. Never. You faced some of the worst conditions out there and still overcame. Rest well my friend and I look forward to the many stories we will share in the future." This is JK's story to tell, not mine. Celebrating a finish with a goodie bag of donuts! Regarding my own running, things have been going quite well. I've run three races thus far this year as I ramp up to my full racing season. 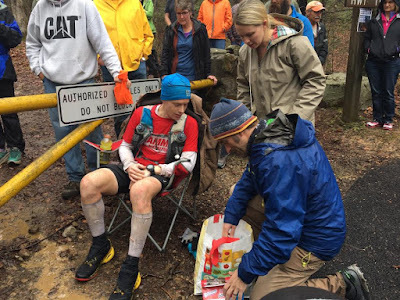 My first real race is in just a few weeks out at the Miwok 100K. I'm super excited to get my "race" on. Back home, my training has been solid. 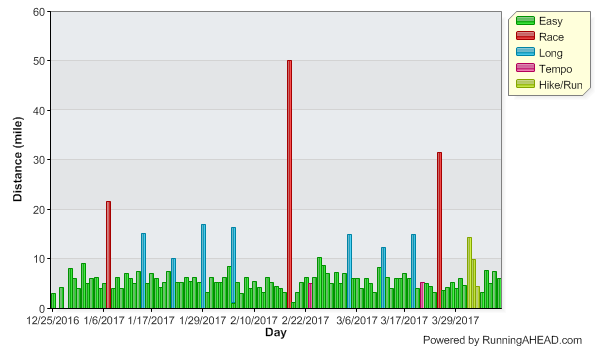 Since Dec 29th, I've run every single day...just surpassing 101 total days. This is by far my longest running streak. 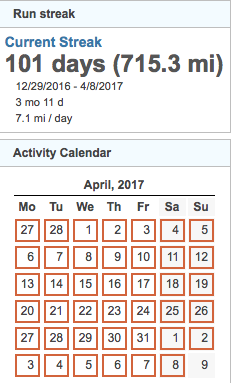 Overall, I've run just over 715 miles, averaging ~7.1 per day, and ~50 miles per week. I managed to run at least 3 miles every day, with the one exception of the day following a 50-mile race in February where I only jogged 1.2 miles. Still...I ran at least a mile (which in my book still counts). Another little factoid, is that every single one of these miles, has been outdoors. I did not run a single treadmill or indoor mile since Dec 29th. I'm quite proud of that little fact, considering a lot of my running has been up here in cold and snowy Vermont. I've never been super into "run streaking" as I always thought it was a bit OCD, but I have always thought it'd be fun to go for a streak for short period of time. I don't know how long I'll keep this one going, but for now, I'd like to try and push it for a few more months at the very least. It's been a great way to keep me motivated and get me out everyday. There have been many nights at 10pm where I haven't run yet and think, "crap, I don't want to break my 94-day streak now!...Get out there and run a quick 5-miler John!". 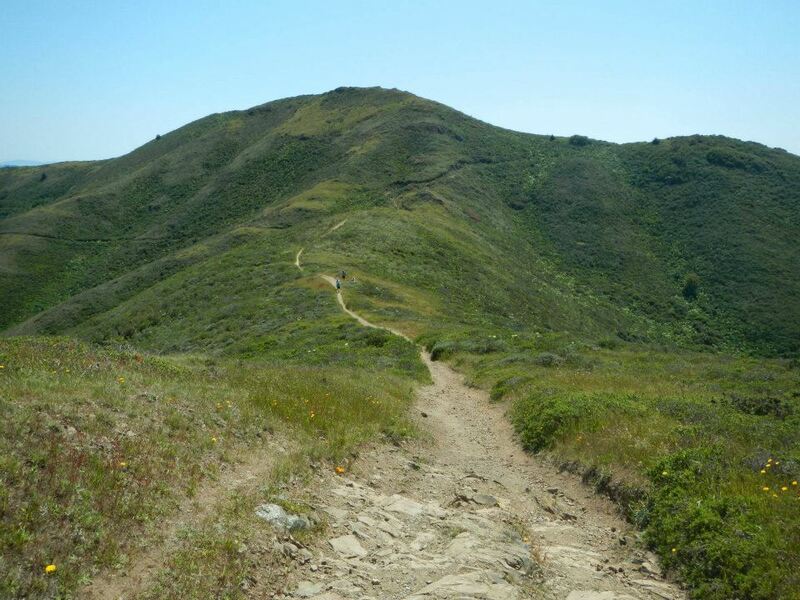 In two weeks I'll be running a local trail marathon here in the Boston area, and then tapering down to Miwok. May is super busy as I have just about every weekend booked with some sort of event or race....but most I will not be running competitively. Miwok though, I hope to actually run hard. For those of you that actually want GPS tracks of my streak, well...knock yourselves out: https://www.strava.com/athletes/13933829 (Honestly though, you have too much time on your hands if you're worried about my silly GPS tracks). One last departing thought. Over the past 10 weeks, I've been teaching my first college level class at Boston University (Paleoclimatology). I was quite nervous going in as to whether or not I'd enjoy it, but I'm pleased at the way things have progressed. There has certainly been a learning curve, but overall, I've had a blast and my students all seem to enjoy the class and material. As a capstone to the class, I took all of the students up to the Dartmouth Ice Core Lab last week and we were able to melt cores from Greenland. Great stuff all around and I hope that I'll continue to have opportunities to teach in the future. Dr. Ferris explaining to my students how the ice-core melting system works.